For someone who is not keen some of North America's classic family dishes (chili, chicken soup, stew), I've been coming to rely on them more and more. They're not my favourites, but they are my husband's favourites, and it appears that, to some extent, my boys have inherited their dad's preferences in this department. So I make stew from time to time. And I've done it enough that I've stopped using a recipe and have started to play with it a bit. Last year I went on and on about my discovery that if you mix equal parts solid butter and flour and add that to your stew at the end of cooking, instead of flouring the meat and browning, you end up with a silky, gorgeous texture and less mess. I was prepared to do that today, but I ended up not needing to thicken it at all. The texture was already perfect. I still like to brown the meat because that crust makes a difference to the colour of the stew, and the layers of texture at the end, but believe me, as I was browning it and watching with dismay at the splatters of oil all over my very recently cleaned cooktop, I wondered whether it was worth it. My other discovery was a recipe that recommended serving the stew with steak sauce, horseradish or Dijon mustard. Dijon mustard on stew is my new favourite thing. It was so good that I kept refilling my bowl, even after I was full, just as an excuse to keep tasting the mustard/stew combo. D went for it, too. He tucked into his bowl and demolished it, and then decided to try more meat and potatoes with the mustard. Season the meat a few minutes before cooking with salt and smoked pepper, if you have it. Heat the oil in a large Dutch oven until hot, and add the meat in batches, so that it has room to sear rather than steam (I find the trick to this is to find something else to do while the meat is browning. You might think you need to watch it with the heat on high, but in my experience, I'm more likely to worry it and stir too often. Go wipe the table, chop some vegetables, or whatever you need to do, while the meat gets a nice dark crust on the outside. Then stir, and let it sit again. This may also have to do with my cast iron enamel Dutch oven, which is slow to heat. I wouldn't recommend walking away from a thin metal pan on high heat, but a heavy pot will take a while to really burn something). Keep browning the meat in batches until it's finished. Remove the meat as it is browned, and reserve. Add the vegetables all at once along with the rosemary, with a little bit of butter and some more salt and pepper. Sauté the vegetables until the onions are clear, then add the meat and juices back into the pan. Add the red wine and cook down until it's almost evaporated, then stir in the tomato juice and stock and bring to a boil. Cover and simmer on low heat for 2 or 3 hours, stirring occasionally. About an hour before serving preheat oven to 375F. Toss the potatoes and parsnips (or other root veggies) with olive oil, herbs, garlic and salt and pepper, and roast for 45 minutes, stirring occasionally, until browned and toasted all over. Then dump the whole tray into the stew. Stir together along with 2 or 3 tablespoons of butter, taste for seasoning, finish with the parsley, and ladle into bowls. Spread mustard over everything as you eat, and discover that you are actually grateful for the oncoming winter, so that you can eat more meals like this. My new favourite recipe is roasted tomatoes. All kinds, with the large ones cut into chunks, and the small ones tossed in whole, a handful of whole garlic cloves, salt and pepper, some fresh or dried herbs and a generous glug of olive oil. Roast them in a dish of some sort (they look prettiest in some sort of pottery or stoneware), and roast them at 325F for a couple of hours, stirring occasionally. I froze the results, which can be used as is as an excellent pasta sauce, used as a base for anything requiring tomato sauce (my husband cooked quinoa in some of the sauce, and it was wonderful), or pureed and turned into soup. I just got to the other side of the Canadian Thanksgiving weekend wondering which I had had more of: hours of sleep, or glasses of wine. I think it was about even. A close friend from Vancouver came to visit. When she flies to Saskatoon, and people ask her why she's going there, she answers, "For dinner," because we always eat well while she's here (and all the time, really, but I make an extra special effort while she's here). 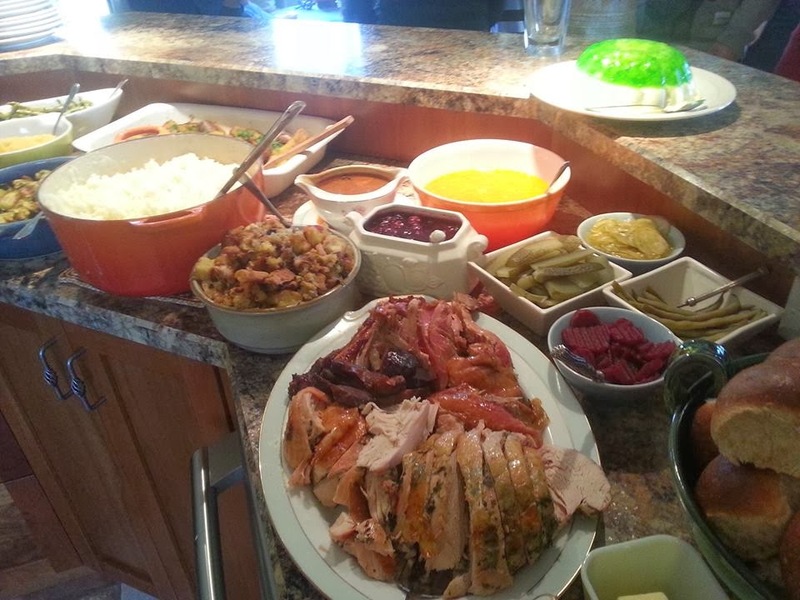 While I didn't post any Thanksgiving plans for the benefit of my Canadian readers, there's still time for any American readers who are starting to think of their own Thanksgiving table. I picked up our turkey, delivered fresh from Cool Springs Ranch. A whopping 20-pounder! We made a trip to the Saskatoon Farmer's Market for eggs, locally grown apples (amazing! ), some kohlrabi and bread for the turkey stuffing. There was pre-cut artisan bread ready for stuffing. Perfect! Then I went home and rubbed the turkey down with kosher salt, and tucked fresh herbs under its skin, to marinate until Monday. Saturday afternoon we entertained other friends who were here visiting family, and I canned tomatoes (my parents went on a road trip during tomato canning season, so I offered to take over the canning process in exchange for some of the finished product. This is far more labour intensive than I thought). Then I picked up my girlfriend from the airport. That night, we headed out on the town for what I planned to be a 'traveling supper', introducing her to Saskatoon restaurants that she'd never been to. We were thwarted, however, by the tendency for many restaurants to close at 9PM. Since we didn't start until 7PM, we were turned away from the place I had hoped would be our main course (Weczeria) because we arrived at 9:15. We had to cross the river and finish our evening on 2nd Avenue instead. It was at the end of this meal that I realized I'd probably had one or two too many glasses of wine, and I still had to make pumpkin tartlets and bun dough for my dinner the next day. I did that, and then crawled into bed at 2:30 am, only to jump out of bed at 7am to prep the turkey the next morning. It was an epic meal. The highlights for me were the cranberry-sour cherry sauce, and the maple-roasted acorn squash. The Brussels sprouts and pumpkin tartlets disappeared most quickly. We've been enjoying leftovers the last few days, and turned the last of the turkey and veggies into turkey vegetable soup last night. While I may be suffering from exhaustion and mild burnout from the weekend, it was lovely. Now that Thanksgiving's over, I can get back to dealing with fast-ripening tomatoes. More on that soon. I haven't really cooked in a while, so I was determine to get a serious fix on Canada Day. Luckily, a large group of long-time good friends were in the city with minimal plans, so with a few phone calls, we made plans to spend as much time as possible together. That involved a BBQ at a friends' house on Saturday, and I arranged for everyone to come to our place on Monday. As I took in the state of my house on Monday morning shortly before my guests would arrive, I realized something about how I entertain. Some people talk themselves out of entertaining by considering it, and then realizing how much cleaning up they'd have to do to allow people in their house. In my case, I make the invitation regardless of the shameful state of my dwelling, then suddenly realize I have some cleaning up to do on top of the aggressive cooking schedule I've set for myself. The house wasn't perfect when our friends arrived, but it was substantially worse for wear once the eight children under the age of five had spent five minutes in it. We're all parents of young children. Our houses don't ever stay clean for long. This is the season of best laid plans going awry, what with fresh produce coming on line at unexpected times. A trip to the Saturday Farmers' Market, for example, got me loaded up with new potatoes and fresh dill. I had had a plan to use 'tapas' as a theme, but those new potatoes were just too good to pass up. My original plan for tapas was inspired by some radishes I had picked up at the Regina Farmers' Market earlier in the week. I have a favourite, simple recipe of thickly buttered bread, sliced radishes, and chopped anchovies that I was keen to repeat. And from there, the fresh produce kind of shaped my plans. Fresh tomatoes would become a Caprese salad, and an eggplant had found its way into my bag, and I needed to do something with that. Dessert would be nothing more than fresh cherries, strawberries and blueberries. Things didn't quite turn out as planned; when I started to dig for meat in my freezer (at midnight, the day before the party), I discovered that all the cuts of meat that would work for a steak tapa were being stored in my inlaws' freezer. I did, however, have two large packages of short ribs, and on a whim, I decided to braise them in red wine. Since they were frozen solid 12 hours before the guests were going to arrive, I took a risk and threw them in the slow cooker. I didn't quite follow the recipe as listed, just used some of my good beef demi-glace, Spanish tempranillo (to keep with the theme) and the classic mirepoix plus thyme and a bay leaf. While I was digging in my freezer, I also unearthed one last bag of my mom's broad beans and a bag of frozen tomatoes. I took those to thaw as well. Then I grabbed a couple of small containers of my homemade salsa from the freezer for good measure. The goal of the day was to get some things underway for shortly after people arrived. Then I planned to cook for a few hours and set things out on the table as they were ready. Send hubbie to check fuel on the BBQ. I followed my family down to the spray park to meet our friends and play for a while. Came back home and assembled fruit and put out chips and salsa and marinated olives for people to snack on while I got the BBQ fired up. That was the last dish. I loved being able to just cook and throw dishes with three or four ingredients on the table and watch everyone enjoy them. Good ingredients just make good food, simple as that. Our last guests stayed until around 6pm, and we just grazed on the food all day. I have been trying to find time to make some rhubarb and grapefruit jam this year, and I may run out of time again—just as I was thinking I might find time this week, I was connected with someone with a glut of garlic scapes. Now instead of jam, in my minimal spare time, I'll be making garlic scape pesto. Not that I'm complaining. I love this time of year and the impromptu gifts of fresh food that arrive on my doorstep. I just have to remind myself to go with the flow, and to not over-plan. My leftover potatoes from Monday will be fried up for supper tomorrow night, tossed with some of those garlic scapes, and I'll be taking some of them with me for our annual trail ride—garlic scapes cooked over an open fire may become my new favourite thing! This afternoon, after weather had kiboshed our plans to head out of town for the weekend, I turned to D and said, "What should we have for supper?" With a big grin, and without missing a beat, he said, "PIZZA!" That was just the encouragement I needed. It is Friday after all, the official pizza day of my childhood. I didn't have tomato sauce, pepperoni or many other traditional pizza ingredients handy, but I did have a grill, some pesto in the freezer, a package of mozzarella cheese, and just enough time to whip up a batch of pizza dough and let it rise before supper. Grilled pizza has a certain je ne sais quoi, which seems to make it taste better with less effort than oven-baked pizza. The trick is to keep it simple, and go light on the ingredients. You'll be amazed at how far you can get with a few high quality items, whether you're doing a full-on pizza party, or just an impromptu Friday family pizza night. Tonight, while I was rolling the dough, I tossed two portabello mushrooms, two Pine View Farms chicken smokies and a red pepper onto the grill to cook. I sliced everything and distributed it among five thin pizza crusts spread with pesto and topped with grated mozzarella cheese. That fed three adults and two pizza monster kids, with a few pieces left over. I have posted my pizza dough recipe previously here in this rambling post. I find there's a bit of a formula to making pizza that helps get past the hurdle of thinking you need certain ingredients to make pizza. I have often found myself in the conundrum of thinking, "I have to make pizza sauce...or go buy it," in order to start thinking about having pizza on short notice. But after a few years of practice, I can take a wider view of what pizza might be. 1. Pizza dough (can be thrown together and risen in about 45 minutes, if you put your mind to it—or pulled out of the freezer and thawed with a few hours' forethought). OR something that will serve as a pizza crust: stale buns, pita bread, naan bread, for example. To bake in the oven, my pizza dough tends to be rolled out medium thickness, to make a slightly bready crust. On the grill, I use the same recipe but roll it thinner, and it comes out much more like a wood oven pizza, crispy and dark. When grilling pizza, be sure all of your ingredients are cooked and prepped ahead of time, like this! The grilling of the dough/adding ingredients happens fast, so you want to make sure you have everything lined up at your finger tips. Throw thinly rolled crust onto the hot grill and toast for about a minute. Brush the top side with olive oil while the bottom cooks. Flip it (and adjust the temperature if it's browning too fast), and immediately spread on your sauce, thinly distributed toppings and a light coating of cheese. You don't want it to overflow and start a fire. Close the lid for about three minutes to let the cheese melt and the bottom toast. Voila! Your pizza is done. As you can see here, grilled pizza can be rustic. No need to be round or even symmetrical. It's all about quick grilling and getting the crust just right. • or the Philly cheesesteak and shrimp option, listed earlier. Experiment and find your own favourites—and a delicious way to use up those last scraps of fantastic ingredients. I just got through Day 27 of my 30 Day Yoga Challenge. Today was the first day that I started to get grumpy about the limitations on my diet. I'm still following it, still practicing yoga, but I'm also starting to think seriously about what I'm going to cook when I'm done this thing. Moussaka, for example, has been on my mind. It's funny the things that have tempted me the most. I tend to want to be where coffee is being made and served, if only to smell it. I just love the taste and smell so much. Surprisingly, I miss coffee more than wine. One of my weakest moments was earlier in the week when I was drinking only smoothies for three days, and someone had left half a piece of multi-grain bread, spread thickly with peanut butter, on the counter. It looked SO GOOD. Confession time: over the last two days, after finishing three days of liquids only, I've felt compelled to taste a small sample of the food I've prepared for my family. If I lived alone, the diet portion (and heck, finding time for the yoga portion) would be a piece of cake (pardon the pun). I can't feed my growing children veggies and quinoa every day. I have a theory about kids and their nutritional needs, and as far as I can tell, there is nothing low-carb about a toddler's optimal diet. This is one of the things that has kept me from eating optimally (for me); because it matters more to me to eat together as a family, and for my kids to see me eating the same things I'm serving them (the message is, there's no difference between grown-up food and kids' food. We all eat the same, healthy stuff). So I've sampled a piece of the elk New York steak (just a bite) and also tasted the beautiful pasta with radish leaf pesto that I served for dinner tonight, as I was eating acorn squash, stuffed with quinoa and almonds. Also tasty, but dammit, I'm ready to have a bowl of pasta if I feel like it. I don't think I'll be going straight back to my earlier status quo, however. I love how I feel, both from the yoga and the food. I have tons of energy, I'm never uncomfortably full, and I'm never terribly hungry. I have become very aware of how good it feels to eat a lot of vegetables. And I mean a lot of vegetables—nutrient-dense ones, like dark leafy greens and squash. After drinking these primarily vegetable and protein smoothies, I don't think I'll be able to take Booster Juice seriously, either. Check out Dashama, the amazing yogini, and one of her smoothie recipes here. In my search for interesting and tasty foods to eat on this diet, I have also uncovered a few gems, which I would like to share. This was a bit of a surprise; it was so delicious that my husband announced that he never needs rice sushi again. Add quinoa to a pot and add water to cover by an inch. Bring to a boil, and cook until water is absorbed, about 20 minutes. In a separate small bowl, bring remaining ingredients to a boil to dissolve salt and steep the ginger. Strain, if you prefer to avoid the chunks of ginger. Add vinegar mixture to the hot quinoa, and mix vigorously with a flat wooden spoon, to break up the grains a bit and make it more sticky. Finely slice or julienne any sushi fillings you like (I used roasted asparagus, avocado, red pepper, green onion, cucumber, carrot, kohlrabi and umeboshi plum, as well as crab-flavoured pollock for the rest of my family) and roll using nori sheets and a sushi mat. I know the instructions are sketchy here, so go here, if you need a tutorial. And it was so pretty, I even took a picture! Unlike me, I know. Instagram may just make a photographer of me. Now that I'm closer to the end, I can see myself continuing with the smoothies, maybe for weekday breakfasts, and then having real breakfast on weekends. Or, if I've overdone it somehow, I can throw in a smoothie to replace a meal. I will also aim to make our salads full of sprouts, kale, avocado, and all of the really healthy, nourishing salad ingredients. Not iceberg, thank you. I will keep making water kefir, which the whole family loves. I have paid it forward to my parents and my inlaws, and was just singing its praises to my neighbours tonight, so they will soon be requesting a starter kit from me, and I'll be happy to share. My last day of the cleanse is Mother's Day. I'm still not sure I'll be able to get through it without brunch, but I've already scheduled a gentle entry back into the unlimited world of food: a movie date with my girlfriend to see A Place at the Table, and a bag of popcorn (another one of the things I've missed most), so I have something to look forward to. The day after, I have a full day workshop, followed by a bus trip back to Regina for two days of working on a contract there. How will I ease into regular eating while forced to eat at restaurants? Still not sure...I'll keep you posted. What happens when an obsessive foodie decides to embark on a 30-day yoga challenge and corresponding cleansing diet? I'm not entirely sure, but I'm in the process of finding out. I have been quiet on the blog front as I got my head around the prospect of 30 days of no dairy, no alcohol, no white flour/rice/sugar, no juice, no grilled/fried things, no red meat, and no coffee (caffeine isn't on the banned list, but with no dairy and no sugar, it may as well be, in my books). Ironically, two days before I was scheduled to start (and timing is tight because I had to sandwich the 30 days between a conference my husband was attending and a conference that I'm attending in May), my parents delivered half a lamb and half a pork, cut and wrapped. Lamb is not technically red meat according to this diet (thank God), so I have managed to sample it in a healthy stew, thanks once again to Mark Bittman's Food Matters. Tahini and Spinach Stew with Lamb was reposted here, thanks to "The Accidental Brainwashed Foodie." Nine days in, I can honestly say so far so good. The smoothie recipes are all made up of real food, so I get to feed my recipe addiction by making them as well as some other healthy recipes. I can still enjoy some variety in my food, which might get a bit harder when I have to drop down to only vegetables, fruits, quinoa and millet in Week 3. But by then, it will be half over, and I'll be able to tell myself I'm on the home stretch. This weekend was a bit surreal, visiting my parents while my brother and sister and our families were all home. This is a time for celebration, since we're not all together very often. We didn't actually get to eat many meals together, since there was a family function on Saturday, which I ended up unable to attend due to sick kids. So I holed up at home, doing yoga and meditating while my kids napped, while everyone else enjoyed their roast beef dinner and celebratory cake. My dad, however, thanks to the arrival of the aforementioned pork, was in full bacon production. He was curing, frying up slices to test every day, and then spent Sunday morning smoking bacon and pork chops. I confess I wasn't able to avoid tasting it completely. I HAD to sample it, as he relies on our opinions of whether he's got the seasoning quite right. So Sunday at breakfast, everyone (but me) got to gorge themselves on salt pork, hard-boiled eggs, tomatoes and toast. I got to enjoy an egg and some tomatoes alongside my smoothie. I didn't find this painful, however. I love food so much that I even enjoy the smells of the food, as well as watching other people enjoy it. G made up for lost time after being ill the day before by finishing off half a plate of the bacon. The dichotomy of being on a diet while watching my family enjoy one of their favourite pasttimes (eating) got me thinking about the lessons in the diet book I'm supposed to be following, which warn against eating beef or pork, or white bread, or pickles. Dashama (the instructor) also speaks about the energy of food, and the environmental impact of eating meat. She also encourages us to do what's right for our own unique situations. Let's use our lunch (following shortly on the heels of the bacon feast) as an example. I helped mix up hamburgers from scratch while my mom made buns. My dad grilled the burgers in between checking the progress of his smoker. Lunch consisted of homemade cole slaw, freshly made burgers on fresh homemade (white) buns, store-bought potato salad, and homemade pickles, old white cheddar, sliced on the vine tomatoes, mustard and ketchup as toppings. The beef came from a cow raised on the farm my parents live on, and was shaped and cooked with love, as were the buns and the pickles. How much does that love count in the 'healthiness' of the food we eat? I don't know if anyone has measured it, but I have long argued to anyone feeling guilty over an indulgence that truly good food, made with love, has its own nourishing qualities that counteract the fats and free radicals. I don't have any science to back that up—call it a 'gut feeling.' Granted, maybe the hamburger feast needn't follow two hours after the bacon feast, but the two meals in themselves were truly nourishing to everyone involved. So along with my box of hemp protein powder, greens powder, aloe juice, kombucha and kale that made the round trip with me to the farm, I brought back three hunks of freshly smoked side bacon and a dozen or so smoked pork chops. They'll go into the freezer next to my pasture-raised goose from Cool Springs Ranch, half a lamb, half a pig, and a few whole frozen fish, and when I'm done my 30 day challenge, I'll resume my daughterly duty of making room in the freezer for a large portion of the beef currently hanging at the butchershop, waiting to be cut and wrapped. And I won't just be cooking it for my family—you can bet that I'll be eating it. I know my habits are changing already. Somewhere in the midst of this challenge, I have jumped headlong into the world of fermentation—not the liquor kind, but the probiotic kind. I now have a jar of water kefir on my counter, a kombucha scoby in my broom closet, and buttermilk and sourdough cultures ready to start. My sister-in-law has milk kefir for me when I'm ready. I'm pretty sure fermenting vegetables and more fun adventures are in my future. But so is goose fat, wine (I took great pleasure on Saturday night, post meditation, reviewing the latest catalogue for the wine club I belong to) and coffee with thick farm cream. I'm really not sure how the outcome of this exercise will look. I know I'll be incorporating some of these practices—maybe all—because they feel really good, and they fit with my philosophy of enjoying wholesome, healthy foods, and my yoga practice will definitely be more entrenched. But I strongly doubt that my definition of 'wholesome' will cease to include cream, butter, beef and pork at the end of these 30 days. It may not be the healthiest choice by some standards, but I LOVE the taste of fresh-brewed coffee in the morning, with a dash of cinnamon, raw sugar and raw cream. Maybe I won't have it every morning, or maybe I'll make a commitment to taking a month off from it every year, but I really doubt it will go completely. And our focus on food is one of my favourite things about my family. It fills me with joy, and it will continue to fill my belly, too. Although perhaps with a bit more moderation. Nine days in, my current perspective is that it's ALL good. Maybe I'll learn a little bit more about eating for nutrition rather than for taste, and maybe that will help me lose that extra bit of post-baby weight that's been hanging on for the last couple years. Maybe I'll balance out a rich dinner with wine to match by having a smoothie for lunch the next day. Maybe this new kefir discovery will help me curb my cravings for a San Pellegrino Limonata while watching a movie. Not sure it will do anything for my popcorn cravings, though. We'll see. I'll keep you posted. Wow, the last meal plan I posted was in June. I have written up meal plans for myself since then, but not as regularly as I'd like. Glad I'm back to not only making them, but sharing them. It's a quiet week, so I have a bit of time to cook. A good foodie friend gifted me with a Bon Appetit subscription for my birthday, and the first issue arrived this week. I'm definitely inspired, and one of this week's recipes is from there. By the time we get to Friday, I'm guessing we'll have leftovers, and I am scheduled for a book club event that night, so I may leave 'the boys' to fend for themselves. There you have it. Something of a plan. Every once in a while, events crash into each other. I had booked a brunch with some old friends whom we rarely get to see anymore. We had a monthly brunch event happening for a while, but somewhere along the way, due to new babies and life in general, it had fallen off the radar. I'm hoping today's event will help to reboot the tradition. We had agreed on a date some weeks ago, and we were all really looking forward to spending some time together. I had spent a week traveling, so was ready to get back into the kitchen after not being able to cook all that time. I was fantasizing about making a brunch of miniatures: mini-muffins, mini-quiches, mini-sausages, and so on. And then the events started to pile up. In a parallel universe, my husband was trying to connect with an old friend of his, who also has a four-year-old. They at one point had talked about getting together for dinner. Hubbie got a text mid-week asking if we were still on for dinner on Saturday. My question: who's cooking? His answer: we're renovating our kitchen. So that would be me. My miniature brunch plan went on the backburner in order to allow me to make two back-to-back meals for guests. It was doable; I just had to think carefully about how to simplify it. Then the next event landed in my lap: my parents wanted to take me and the boys on a road trip to North Battleford to pick up a desk that my aunt wants to give me. When my dad asked, "Are you free Saturday?" I said, "Well, I'm making dinner for people that night." He said, "Oh, we'll be back in lots of time. It'll just take the morning to do it." Uh-huh. Well, it's an hour-and-a-half each way, and we were leaving North Battleford at 2:30, rather than getting back to Saskatoon. Our guests arrived before we did, since we had asked them to come early for a playdate before dinner. The good news is, Hubby's friend is very patient, he brought an excellent bottle of wine, and he helped me carry the desk to my office. I digress. Now that you have the background, I'll share my menus for the two meals. First, dinner for four adults and three kids; second, brunch for eight adults and six kids. Once again, I am so grateful for the fantastic meat that lands in my freezer. I made full use of the wild game in both meals. The lesson here is that with the right freezer/pantry products, you can make a fabulous meal in no time at all. Goose rillettes (inspired Hunter Angler Garden Cook), using frozen goose meat from Christmas, as well as duck broth and fat, and some Stonewall Kitchens fig and walnut butter, on brioche. I have eaten a lot of meat in my life, so I can say with authority that the moose tenderloin we ate last night was the most beautiful meat I have ever eaten. It was shockingly tender, beautifully flavoured, and just a tiny bit of sweetness from the simple chokecherry brandy sauce (I simply deglazed the pan with beef stock and homemade chokecherry brandy). And the Wolf Blass Grey Label Shiraz-Cabernet Sauvignon was an excellent match. After our guests had gone home and our kids fell asleep, I did a bit of prep for the next day: I made elk sausage patties and put together the dry ingredients for the biscuits I was going to make the in the morning. Brunch came off without a hitch. The breakfast sandwiches will definitely be happening again. I managed to take some time for a walk in the lovely weather this afternoon, before balancing our meat-heavy meals with a Sunday supper of Urad dal and millet with corn and coconut milk (from Mark Bittman Food Matters) These are not normally meant to go together, but I wanted to use Urad lentils, and I was in the mood for coconut. The combination was filling and comforting. Stay tuned; I'll be posting my meal plan for this week (long time since I've done that) soon! In keeping with my promise to make good use of all the food we have and avoid wasting, I have discovered wonderful uses for two of my least favourite leftovers: porridge, and pilaf. Cold porridge used to either get ignored on the stove until it was inedible, or packed into the fridge and left there until it was past its prime. I have already published other posts about leftover porridge, and have made bread and cookies from it in the past. I have also been regularly making cooked oatmeal scones, thanks to this recipe. My husband often blends quinoa and large flake oats to make a filling and protein-rich breakfast. If there's even a cup leftover, I'll save it and turn it into equally filling and protein-rich scones. That got me pondering another possibility: probably our biggest food waste issue is pilafs. I often make a whole-grain side dish of some sort, from barley, quinoa or some other grain, and there's always more than we can eat, and all of us are less than enthusiastic about seeing it a second time. It often sits until it's beyond using, and then I grind my teeth about waste as I scrape it into the compost. But if you can make great scones out of leftover porridge, why couldn't you use the same basic recipe and make biscuits out of leftover pilaf? The answer is: YOU CAN! Melt butter and stir into pilaf along with milk. Mix dry ingredients together and stir into the grain mixture. Add cheddar cheese, if using. Batter should be stiff but quite sticky. Gather together and place on a well-floured surface. Pat into 3/4" thickness, and cut into squares, triangles or circles (or whatever shape you like). Bake at 350 F for 15-20 minutes. One more waste prevention tactic in place...check! So up here in Canada, there's not much of a 'chicken and waffle' culture. But it's catching on. I've heard there's a local restaurant that serves a version for Sunday brunch. And I've seen it enough times on Diners, Drive-ins and Dives that I perk up at the mention. An ex-chef friend of ours invited us for dinner in November, and tried his own version. He fried the chicken in a traditional style, and then served it atop the waffles with a dollop of cranberry sauce, creme fraiche and smothered the whole thing in a maple-chicken reduction. I vaguely remember coleslaw on the side. The entire dish was amazing—every mouthful made me think, "MORE!" Half-way through my serving, I was thinking, "I am definitely going back for seconds." (in spite of the fact that this was the third course of a rich meal, following creamy cauliflower soup with bacon and mussels and a fantastic mushroom quiche). However, my body caught up with me. Only two bites later, the deep-fried, creamy, sweet concoction hit the bottom of my stomach with an almost audible thud, and I was instantly over-full and uncomfortable. Isn't that always the trouble with fried chicken? Well, in a sort of meandering way that I've started to adopt in the kitchen, thanks to an overstuffed freezer and a workload that often gets in the way of my preferred meal plan approach, I managed to make my own version of chicken and waffles today, which was relatively low in effort, healthy (aka lower in calories and high on fibre), and absolutely delicious. So the answer to "does the chicken in 'chicken and waffles' have to be fried?" is, no. Unless you're a purist. I am often a purist, but on weekdays, I allow myself to stray far from pure. I began considering what to do with some turkey pieces that I have in my freezer (as an aside, I ordered a gorgeous fresh farm turkey this year for the sole purpose of cutting it down so that I can use the breasts to make Turkey Mole Poblano. The benefit of getting the turkey breast is that I also got a fresh carcass with which to make stock and I froze two packages of a single leg, thigh and wing together to make other meals. Since the Mole Poblano requires a substantial time commitment, I haven't yet accomplished that, but I've really been enjoying the turkey pieces). There aren't a lot of recipes online, or anywhere, really, for turkey pieces. You're usually expected to cook the whole bird, or just the breast, or use ground turkey. But I discovered tonight that you can truly just season and roast the pieces for a couple of hours, with great success. I've also been tired of trying to figure out side dishes. I think it's partly the winter blues, and resenting having so little good quality fresh food to work with, partly a lingering virus that has been sapping my energy, and partly burnout from the Christmas cooking season. Anyway, I thought through all the grains I have and the options of root vegetables, and couldn't really get behind any particular recipe. Until I thought about waffles. We had just had an impressive breakfast of pumpkin pancakes (our favourite pancake recipe, with a 1/4 c. of pumpkin, 1/2 t. cinnamon, a pinch of cloves, and 1/4 t. each ginger and nutmeg), crisped prosciutto and scrambled eggs with salted herbs, and I was still swooning over the pancakes. Could waffles be a side dish? Why not? They're a traditional match for chicken, after all! We also had some mediocre chicken gravy left over from a slow cooker chicken that my hubby had prepared on the weekend while I was attending a conference. The chicken had since been turned into lunch time noodle soup, so the gravy needed using. I thought, "I bet if I added maple syrup to that gravy, it would be just the thing for chicken and waffles." So I put the turkey on to roast, seasoned with Kosher salt, black pepper, and smoked paprika. I found a delicious sounding whole grain waffle recipe in Mark Bittman's Food Matters. The recipe was thoughtfully posted by another blogger, stirandstitch, here. I must also say that one of the reasons I hadn't yet tried the recipe is that dividing eggs and whipping up egg whites is a little too involved for me, early in the morning. At dinner time, however, it's a-ok. I also added a cup of frozen corn kernels, just to make it a bit more dinner-like. I topped the waffles with a bit of roast turkey, drizzled the maple gravy over top (I really don't know how to tell you quantities for the maple gravy. I re-heated about 1 1/2 cups of gravy, drizzled in a couple of glugs of maple syrup, stirred, tasted, and added another glug. Probably about 1/3 of a cup, if I had to guess, but don't quote me. Just glug and taste), and served with a side of steamed green beans and a tossed salad. The kids at the table were VERY quiet, which we always judge to be a good sign. And my husband and I liked it too. And it did not hit my stomach like a lead weight, as fried chicken is wont to do. So I could have seconds!